This system is simple but it works! It helps you remember where to place your fingers and makes your chord changes much quicker. 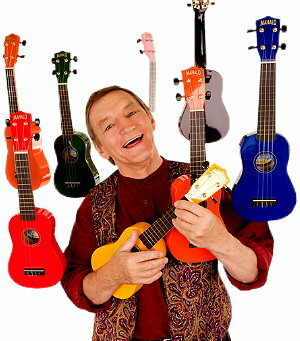 Set up your Ukulele by placing a set of sticky coloured paper dots from a newsagency, or office supplier, on the fretboard as shown in the diagram. You’ll need red, yellow and green dots. Place your third finger on the red dot – you have made the C chord. Place your first finger and second finger on the yellow dots – you now have the F chord. 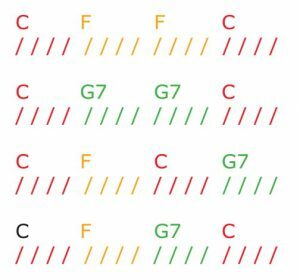 Leave your first finger on its green / yellow dot and place your second and third fingers on the green dots as shown – this is the G7 chord. Try repeating these chord patterns with 4 strums on each chord. If this is difficult, play the pattern with 8 strums on each chord, then four strums , then 2 until your chord changes are fluent. If a particular chord change is giving you trouble, slow down your strumming and practise only that change until you are comfortable with it. 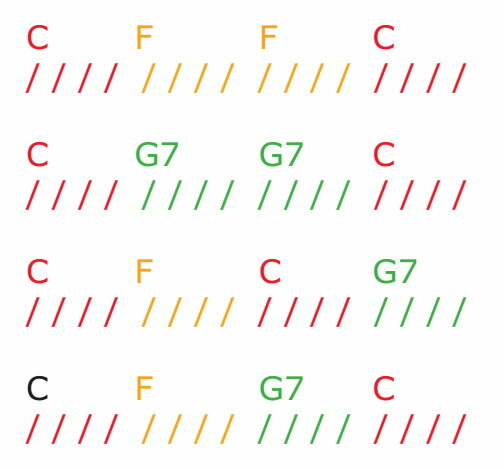 C = Red, F = Yellow, G7 = Green and you’re set to go!